More details and more charts, from Guy Ottewell. View larger. | Here is the view from Earth to the moon as it goes through our shadow on July 27, 2018. Chart via Guy Ottewell. Originally published at Guy Ottewell’s blog and reprinted here with permission. By the morning of July 27, 2018 – as registered on clocks in the Americas – Earth will have passed between the sun and Mars, and the Mars opposition will have passed. Near-perihelic oppositions like this one are the best in that the planet is nearer to us, so appears larger and brighter. Mars will be negligibly nearer a few days after opposition, and farther north from September onward. It will remain bright in our sky for at least another month, and into Northern autumn. But the main reason you might want to turn your telescope its way is: the moon. As Mars came to opposition, the moon was marching toward it, so the sky has been flooded with moonglare. That continues until, around 10 hours after the opposition moment, the sky begins to darken as the moon encounters Earth’s shadow. The moon is, at this month’s full time, only just short of reaching its descending node across the ecliptic. That is why it goes almost through the center of the shadow, and this will be a long total eclipse. The umbra is the core shadow. No sunlight reaches it directly, but varying amounts can be refracted into it by Earth’s atmosphere. This is why it can appear brownish or even reddish, in patterns that vary at every eclipse. It is why the media have taken to calling a totally eclipsed moon a Blood Moon. The image at top shows our view of the moon from Earth. And here is the moon’s view of Earth passing between it and the sun. This shows the hemisphere of Earth from which the moon is visible. View larger. | These locations on Earth will view the July 27, 2018 eclipse. Chart via Guy Ottewell. – 17:13 UTC (13:13 EDT, 18:13 BST): Beginning of penumbral eclipse: Earth’s pale outer shadow touches the moon, which is rising for Turkey, Egypt, Congo, is in the sky east of there, setting for Kamchatka and the southern Pacific. – 18:24 UTC (14:24 EDT, 19:24 BST): Beginning of partial eclipse: Earth’s dense inner shadow (the umbra) touches the moon, which is rising for eastern Europe, southern Italy, Libya, Nigeria; in the sky for much of Africa and Asia and all Australasia; setting for Hokkaido and the southern Pacific. 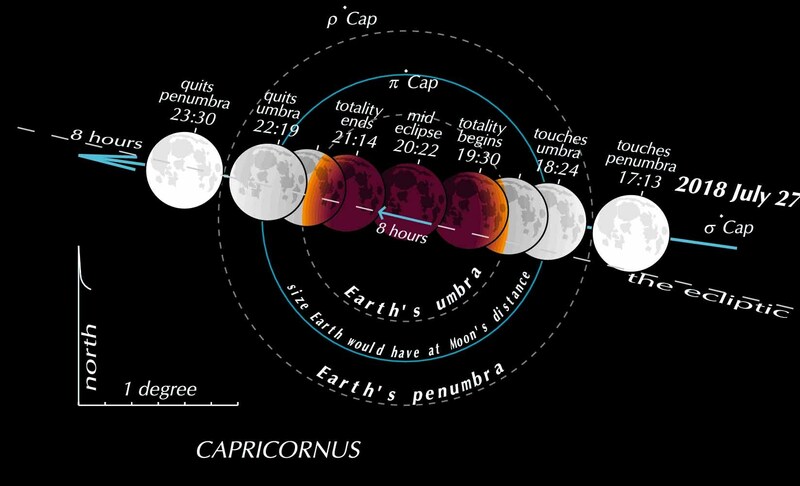 – 19:30 UTC (15:30 EDT, 20:30 BST): Total eclipse begins: the moon is inside the umbra. It is rising for southern Scandinavia, Germany, mid France, mid Spain, Morocco, the southern Atlantic; up in the sky east of there; setting for Japan, Micronesia, New Zealand. – 20:22 UTC (16:22 EDT, 21:22 BST): Middle of the eclipse. The moon is in the sky for the hemisphere centered east of Madagascar. – 21:14 UTC (17:14 EDT, 22:14 BST): End of total eclipse: the advancing edge of the moon begins to leave the dark shadow. It is rising for the east coast of South America and for the Atlantic off Scotland, thus is low in the southeast for all of Britain and almost all of Scandinavia; is higher for the rest of Europe, all of Africa, half of Asia, is setting for eastern China, the Philippines, central Australia. – 22:19 UTC (18:19 EDT, 21:19 BST): End of partial eclipse: the last dark spot of Earth’s umbra quits the rear edge of the moon, which is rising for a bit of Iceland and for Venezuela, Bolivia, Chile; in the sky for Europe, Africa, Asia as far as where it is setting for western China, Borneo, western Australia. The inner part of the penumbra is faintly gray, the outer part indiscernible, so this is the practical end of the eclipse. 23:30 UTC (19:30 EDT, 22:30 BST): End of eclipse: Earth’s outer shadow quits the moon, which is rising for Iceland, Newfoundland, Haiti, Colombia, Ecuador; in the sky for Europe, Africa, Asia as far as where it is setting for Bengal, a bit of Sumatra, the ocean off Australia. In southern Britain, the moon rises about 19:40 UTC, which is 20:40 BST. So the total eclipse has just begun. View larger. | Don’t forget! The totally eclipsed moon will be near Mars, now just one day from its 2018 opposition. Chart via Guy Ottewell. Bottom line: July 27, 2018, total eclipse of the moon by Guy Ottewell. Looking for more? Try this article by Bruce McClure on the July 27 eclipse, which is this century’s longest lunar eclipse.